The ultimate hippie skirt. 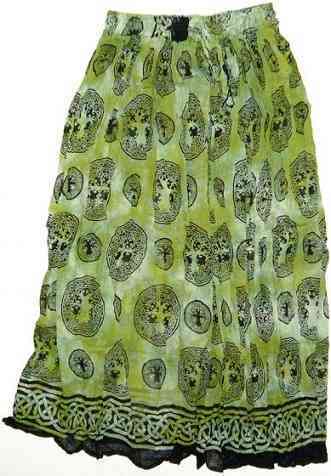 A free flowing lightweight summer skirt, that is made of cotton, with a very stretchy elastic waistband and the tree of life design printed all over. The skirt also has a drawstring for extra control. It measures about 36" long, and the waist starts at 24" around and stretches to a maximum of about 36" around. A nice lightweight hippie style skirt. I love this skirt!The fabric is so lightweight which makes it perfect for the summer and spring. I can see myself also wearing this to the beach as well as just a regular garment. My only problem is that it is a bit see through/sheer, but not a lot. Overall great purchase!